Oxford University Press, USA, 9780199811410, 240pp. The term "reproductive politics" was coined by feminists in the 1970s to describe contemporary Roe v. Wade-era power struggles over contraception and abortion, adoption and surrogacy, and other satellite issues. Forty years later, questions about reproductive rights are just as complex--and controversial--as they were then. Focusing mainly on the United States, Reproductive Politics: What Everyone Needs to Know(R) explores the legal, political, religious, social, ethical, and medical dimensions of this hotly contested arena. Tracing the historical roots of reproductive politics up through the present, Rickie Solinger considers a range of topics from abortion and contraception to health care reform and assisted reproductive technologies. Solinger tackles some of the most contentious questions up for debate today, including the definition of "fetal personhood," and the roles poverty and welfare policy play in shaping reproductive rights. The answers she provides are informative, balanced, and sometimes quite surprising. 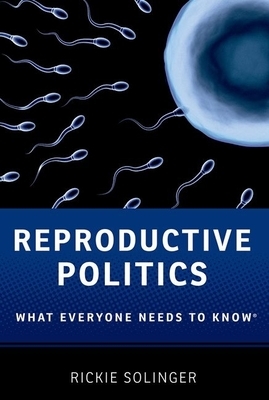 Offering a wide range of information in an accessible and engaging manner, Reproductive Politics: What Everyone Needs to Know(R) orients readers and provides the knowledge necessary to follow the debates in this important and continually evolving field. Rickie Solinger is a historian and curator. She has written and edited a number of books about reproductive politics, including Wake Up Little Susie: Single Pregnancy and Race before Roe v. Wade and Beggars and Choosers: How the Politics of Choice Shapes Adoption, Abortion, and Welfare in the U.S. Solinger has organized exhibitions that have traveled to 140 college and university galleries over the past eighteen years. She lives in the Hudson Valley and New York City.